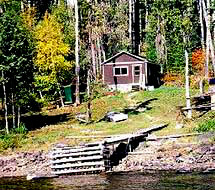 Aba lake offers both walleye and northern fishing. Plenty of fish, an exciting plane ride, solitude and few “trophies” each week – this is a fisherman’s paradise! Aba can accommodate up to 6 guests. The cabin at Aba is a basic outpost with propane fridge and stove. No solar power or running water.